Regarding differences between Star Wars story and saga films, I failed to notice the omission of the iconic Star Wars ‘wipe’ in Rogue One. We did have versions of the film [with] wipes, and then it just felt like we were doing it because we could. The wipes are the cheesiest thing in the world. The only time you can ever do it and not be cheesy’s in Star Wars. There’s part of me that wanted the wipes and things like that, but the film is supposed to be different. We were given a license by the studio to be unique from the others, and we just took that license and ran with it as an excuse to try and be a bit more out there. While I won’t disagree with Edwards, I think “cheesy” is the wrong word. Whimsical, perhaps? Michael Giacchino (Lost, Star Trek, Up) is the first Star Wars film composer to step foot in John Williams’ shadow. Giacchino, the long time J.J. Abrams collaborator, had replaced Alexandre Desplat (Harry Potter and the Deathly Hallows, The Grand Budapest Hotel). EW: What inspirations will we hear in the music? MG: It does borrow from traditions that both John [Williams] and George Lucas borrowed from when they made the original Star Wars, you know. George was looking at Flash Gordon, the old serials, and John was looking at [Gustav] Holst and different composers along the way to get a baseline for what he wanted to communicate. There is a wonderful musical language that John put together for the original films. I wanted to honor that vernacular but still do something new with it, something that was still me in a way. My great friend Scott Kawai often makes the case that Michael Giacchino is the next John Williams, with a style heavy of colorful and memorable themes. Without reading too much about Rogue One, I assumed he had been the first choice for the film. The revelation that Desplat was the first choice was a shock to me. Desplat’s music is certainly incredible with an air of moody atmosphere, but does not strike me as “Star Wars”. I’d kill to hear his take on Rogue One. 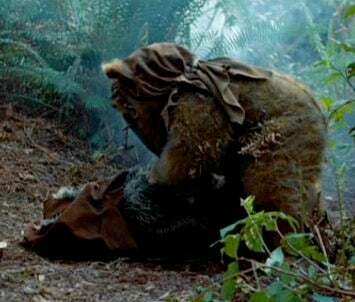 There are inclinings of the saga’s legacy in Giacchino’s score— curious woodwinds and dancing percussion at the opening of “He’s Here For Us”— but there is a drive in the timber that strikes less fantastic and more brooding. It is immediately clear that the “stories” have room for exploration and departure from the “saga”. There are ties back to the episodic series, but at their core, Giacchino’s pieces are something new and derivative; they are always less memorable, iconic, or sure of themselves. Nonetheless, there are many times when the presence of brass brightens and lifts what is ultimately a grittier film to something more familiar and nostalgic— something more reminiscent of Star Wars. As for the touches of William’s throughout Giacchino’s score, The Force Theme is heard when Bail Organa enters the frame. Likewise, The Imperial March is heard during Darth Vader’s appearance. During the film’s finale, both themes are heard as two iconic characters make stunning (re-)appearances, which can be heard in “Hope” on the film’s soundtrack. However, the one that struck me the most was the piece backing Rogue One‘s title card, the finale of “A Long Ride Ahead” on the soundtrack. Briefly teasing Williams’ Main Title sequence, it kicks off the iconic C-G half-notes but branches into something new and less confident. Kathleen Kennedy says they’re trying to break from some of the traditional Star Wars tropes, like doing away with the opening crawl. Sounds like that applies to the music as well? As a story outside of the saga, Giacchino’s freedom is extremely evident, for better or worse. My question is whether or not Giacchino’s score will be the audible language of all Star Wars stories to come, or just specifically Rogue One? Even more specifically, is Rogue One‘s title card sequence strictly Rogue One‘s title theme, or has Giacchino defined the theme for all Star Wars stories? The other changes—the omission of the opening crawl, lower-left location queues, a lone title card— are so heavy-handed that it leads me to assume the themes Giacchino has established for Rogue One will permeate future Star Wars stories. I’m being torn apart. Did I like it? Yes. Did I love it? No. Did it live up to the hype? Maybe. My pros/cons list weighs heavily on the dark side, but the experience steers the franchise toward the light. The film opens with a fleet of stormtroopers storming a village. In one particular instance, as one goes down, another, FN-2187 (quite obviously Finn for anyone who’s seen the trailers), without firing a shot, has a sudden change of heart about being part of a war-machine. Is this his first fight? Was the death of that particular comrade important? The audience would be better served if we understood the bond between Finn and the downed stormtrooper, or if there was some understanding that this was FN-2187’s first fight. Not to mention that Finn’s introduction is mixed with a barrage of other main characters Poe, BB-8, Kylo Ren, and Captain Phasma within the first ten minutes. This all felt like a lot to digest. On the topic of characters, I never got on-board with Finn. He feels more like a Star Wars uber-fan living out his fantasies than true-blue Star Wars lore. But maybe that’s because Finn is the only character that doesn’t really have a Star Wars legacy identity. Rey acts as a brilliant blend of Han and young Obi-Wan while Poe waxes a bit “pilot” Luke. If anything, Finn’s overly comedic performance rings closer to Jar-Jar than any other legacy character. That’s not to discount everything John Boyega brings to the table, namely his performance in the Takodana bar and his lightsaber battle against Kylo Ren. But in large part, I began to dread his appearance on-screen. I would have gladly traded the abundance of Finn for the lack of Leia’s most talented pilot, Poe. If there was one thing The Force Awakens is not short on, it’s dog-fights. Battles overall, for that matter. However, while dog-fights are a boon for a Star Wars fan, not one of these takes place in space! What’s a Star Wars movie without a war amongst the stars?! (This may not be the fairest gripe, but it’s an observance worth bringing up.) In any case, ground combat felt fantastic, with practical explosions and the bodies of stormtroopers flying about; CG effects seemingly only used for blaster fire. As heavy-handed as the practical-effects were, the allure they have been brought on to create is thrown out when two major characters appear as CG constructs. Like Finn’s out-of-place character, these characters took me out of the world that J.J. had constructed and put me back into the tried-and-tired trope of major CG reliance. On the flip side, the lack of large scale CG set pieces and battlegrounds made this epic feel eerily small. Each scene feels like a specific set piece rather than a fleshed-out world. (There are similar scenes in The Hobbit films and Indiana Jones and the Kingdom of the Crystal Skull.) Suffice to say, most of the sets (and some of the acting and scene transitions) made the movie feel like a stage-play. Good: It’s a Star Wars film that feels like an Abrams film. While the characters, design, and story feel fairly true to the Star Wars universe, the film feels far removed from the language Lucas established with the original trilogy and certainly the prequels. So much so that I still feel like I’m having to check my opinion against what I’ve come to know and expect of Star Wars films, even the great ones. (Am I bothered simply because what I expect of this universe feels alien? Is that bad? Am I guarding myself from another Phantom Menace folly?) This is a good thing. “Enhancements” aside, we will always have the original trilogy and it’s refreshing to see a new take on this universe. Warm: There are call-backs and nods. A lot of them. Maybe too many of them. But every single one feels like a treat that I apparently can’t get sick of. (They felt more natural the second time around.) Say what you will of The Hobbit films, it was nice to see the cast back together. The same feeling is exuded in The Force Awakens. Even more so. Some of the references feel forced, but that is too be expected. I imagine the audiences experiencing the Star Wars saga (well, episodes IV-VII) straight through or for the first time won’t be as phased by the obvious. Fresh: The final scene. Our reunion with Luke opens the story in ways that The Empire Strikes Back had no other option but to fill in after the fact. Never has there been a Star Wars film where the future was so foreign to the audience but so presumably mapped by writers. (The script for Episode VIII was finished before the release of Episode VII. Unprecedented for a non-prequel Star Wars film. ) We know bigger things are coming and I’d argue that Episode VII simply exists to whet our appetites. That’s not to say it’s a cliffhanger, but through Luke, the mysteries and color of today’s Star Wars universe are on the cusp of being revealed. [EDIT]: Added paragraph about set pieces and stage-plays. 1/1/16: Edited and revised after second viewing. For example: New weapons and items unlock at what feels like a glacially slow pace, but that forced me to focus on becoming competent with the items I had on hand and genuinely improving. Compare that to Call of Duty, where I tend to flit between the shiny objects I seem to unlock after every round and never really live with one long enough to become deadly. For a casual fan like myself, that’s a big plus. Admittedly, that slow pace (along with the lack of weapon customization) left me without the compulsive burning desire to play “just one more game” only to see what new trinket was right around the corner. It’s an impulse that games like Call of Duty and Destiny have down to a science, but science isn’t always a great substitute for fun. I want to play more Battlefront because it’s just that: It’s fun. I vividly recall spending hours with the original Star Wars: Battlefront for PS2. An hours more with Star Wars: Battlefront II. They were unlike any shooter I had ever played. And surprisingly for a licensed game, they were fun. With the notable exception of Boba Fett (and even he has a bizarre and unwieldy control scheme), I have much more fun as an anonymous Rebel or Stormtrooper. Their modes are much more interesting than the movie hero power trip. I recall feeling initially jarred when diving into the original. I had come in with the expectation that I’d be questing as one of the franchises heroes, and it turned out to be my first experience of the Star Wars universe outside of the perspective of said heroes. I quickly became fond running missions in anonymity. I had an avatar in the Star Wars universe with no preconceived story arc. In turn, anonymity only amplified my desire to continue playing. I’ve been looking forward to the Star Wars: Battlefront reboot for a long while now. Review events are a reality of the industry, and in the case of multiplayer-oriented titles, they make sense — it’s very difficult to organize 20-40 people in different locations remotely at the same time, and we introduced provisional reviews this year to account for server uncertainty. We’ve attended review events this year when it made sense to do so, including events for Call of Duty: Black Ops 3, Metal Gear Solid 5: The Phantom Pain and even Battlefield Hardline. But we will not participate in review events that tie our hands in ways that restrict us well after the general public has full access to the game in question. With that in mind, we’ll be playing the full version of Star Wars Battlefront on EA Access this week, along with many of you, without support from EA. As we have not agreed to any advance access or accepted any coverage restrictions, our provisional review will be live once we are confident in the opinions of our pair of reviewers. And if this is truly new dialogue, Luke state’s that his ‘father has it.” Has. Not had. It’s fun to imagine Vader is still around, but whether it’s clever audio splicing or Luke referring to the omnipresent (Force ghost*) Anakin, I say Vader is dead and gone. I need to figure out a way to be a part of this upcoming series of Disney Star Wars films. * Thanks for the heads up to @AlexandreSitbon. The term was slipping my mind.